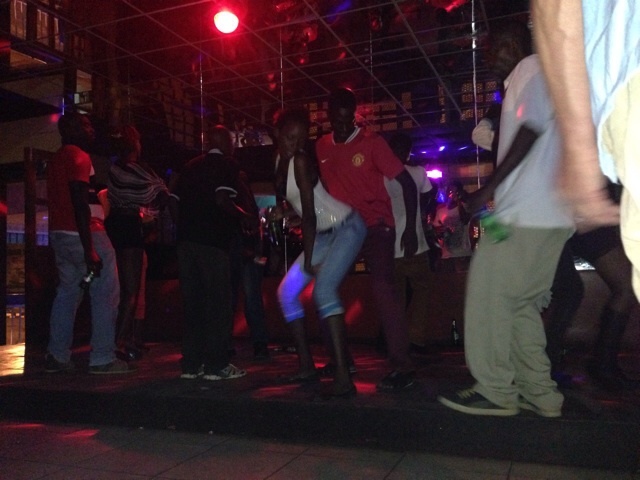 The last two weeks have whizzed by since leaving Jollyboys backpackers in Livingstone, Zambia. 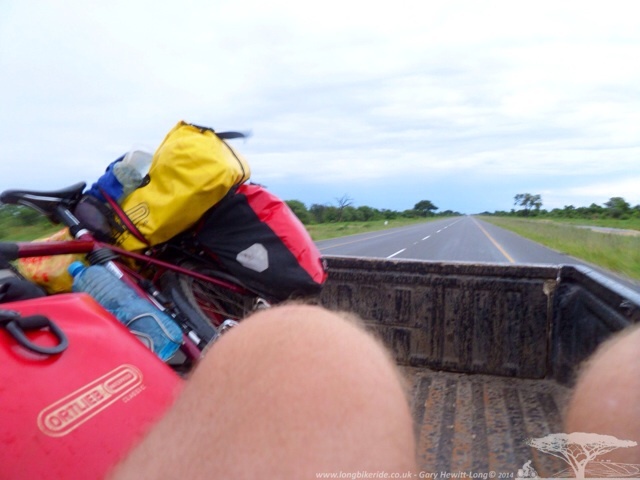 I’ve ridden just under 900 miles through Botswana quickly despite stopping in the capital Gaborone and arrived in South Africa, the country of my final destination, Cape Town. 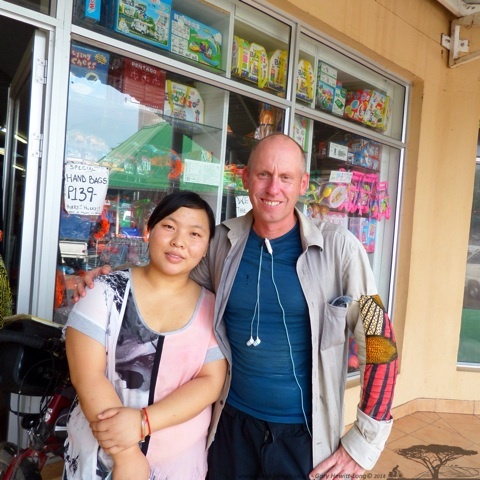 The time spent at Jollyboys backpackers thoroughly enjoyable, staying longer than originally intended partially because my legs and ankles had swollen and also the people staying there made it a very nice place to stay. Maurice from Ireland, Geoff from the USA and I decided to visit the railway museum, leisurely strolling down to the museum from the backpackers in the afternoon heat, we got a little sidetracked. 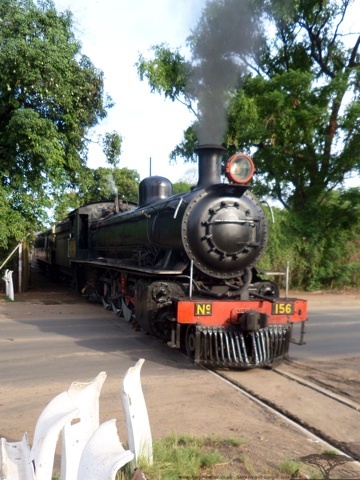 There was a yard with a restored steam train in so we entered, a security guard approached and explained the train was used for tourists to travel to the falls and a local game park. Meals were served during the journey. Keen to show us the train he acquired the keys to open up and show us inside. On Saturdays and Wednesdays it takes passengers from the yard on their trips and was set to leave in a couple of days, we all agreed we’d like to see it leave and walked down to watch the magnificent old machine in action. Taking the Old train to Livingstone, Choo, Choo! Another evening we decided to visit a local nightclub, but it wasn’t as good as we had hoped so one of the local guys suggested we go to another club further back in Town. We followed and what a night. The place was busy and upstairs there was a big dance floor with a large mirror. The dancing something I have not seen before, the woman dancing in a very sexual manner, everyone staring at themselves in the mirror and all of the women doing the “backing up” move. Bending over and pointing there backside at someone and then hopping backwards thrusting themselves into the person who was targeted. One young girl targeting Maurice, Geoff and I. Maurice was getting into the swing of things and at one point returning the move to the young girl, almost knocking her over. The movements he was making indelibly lodged in my brain, not necessarily a good thing.. 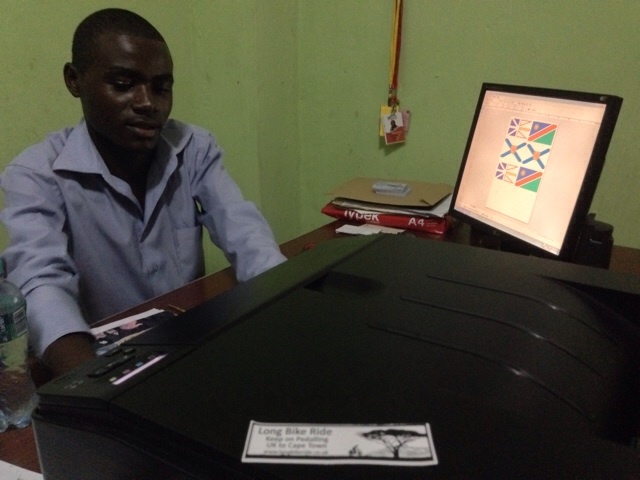 But oh so funny..
Maurice came back one afternoon with more country flag stickers for his bike, ones which he had visited but had not been able to source stickers and proceeded to tell Geoff and I about the print shop he had found nearby. Next day we all went and I had some long bike ride stickers made up by Joshua. The photo’s not great but I think they came out quite well! I left one on the Hostel water cooler. 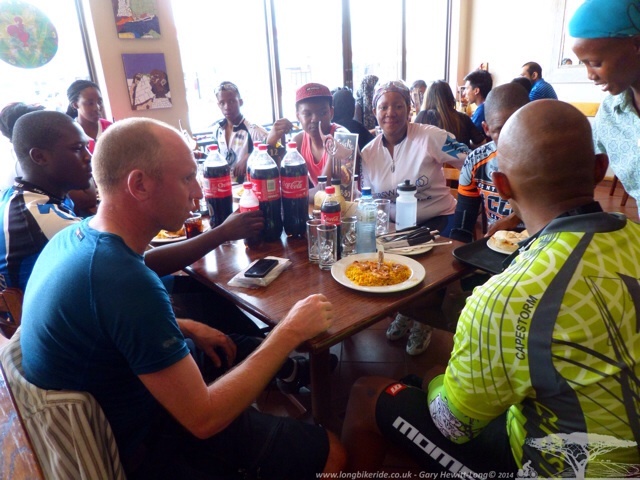 On the Friday I was in two minds as to whether to leave but I knew I had to get moving if I was to arrive in Johannesburg before Christmas, I’d been stopped a lot longer than I had originally planned so I said farewell to all the new friends I had made. Jollyboys backpackers turned out to be a great place to stay with many friendly nice people staying, Maurice was still waiting for a part for his bike, Emile, Rosemary, Fenne, Geoff, Gerwin and Anne made the place very special to stay at, always someone around to spend time with if you wanted. Arriving at the border for Botswana, money change time again, Zambian Kwacha to Botswana Pula. No surprise the money changers were offering atrocious rates. Riding away to find something to eat and drink one guy followed me to a food stall. Giving me more spiel on bad exchange rates I explained the rate I was willing to do a transaction on, he kept explaining and I reiterated the ONLY rate I would change at or I’d take the money with me. Again a story of not being able to change money over the border, in return I explained that I could change the money in the UK on my return so was not bothered about changing the guy reluctantly agreed to my exchange rate. 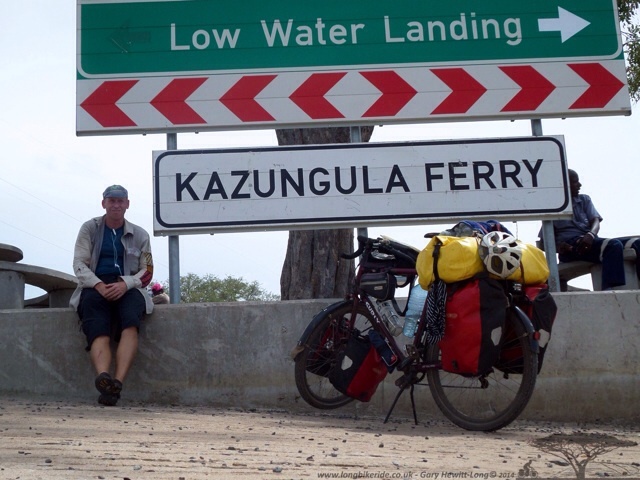 The Kazangula ferry crossing was easy, bicycles being free; it was a short 3 minute ride over the Zambezi to Botswana and a 1 minute ride to the immigration post. The crossing was very quick, just enough time to take a photo as it crossed the Zambezi River. 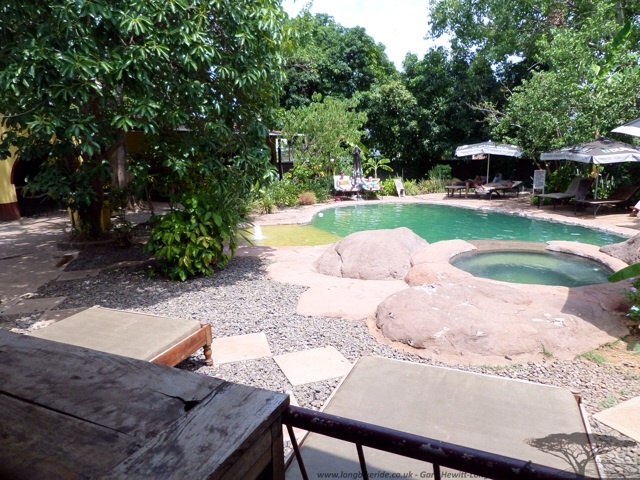 My plan was to stop at the Chobe Safari Lodge, recommended by Mike and his family, making my way there via the Mascom phone shop and picking up a sim card. The phone shop was unable to cut the card and explained that a Chinese shop around the corner could cut it. The proprietor Aisla said it would cost 20 Pula to cut; I asked for a reduction to 10 Pula and explained my trip, in the end she kindly cut the Sim card for free and helped me load it with credit. Rested I excitedly set the following morning to ride toward Nata from Kasane, known as the Elephant Highway. The chances of seeing game and of course Elephants was extremely high. Disappointingly for the first 20 miles, there were no signs of elephants… well that is other than the signs by the roads warning road users of elephants. After it was a different story, I saw my first elephant that I was going to cycle past, a big male bull who wasn’t overly impressed to see a cyclist. With ears flapping he stood just off the road looking at me looking a little ill at ease with my presence. I rode past him and then stopped further down to watch him cross the road. After seeing elephants I started to see more wildlife, more elephants some with babies, others alone and others in a small group. One large group and several lone males. One male in particular saw me and comically walked behind a thin tree as if to hide, not an easy thing to do as he was so large. He looked agitated and was flapping his ears. As I passed him I whistled to see if it would invoke a reaction… it did, he trumpeted and then charged toward me. My acceleration was phenomenal, faster than I have ever sprinted before despite the fact I was on a loaded touring bike, the adrenaline soon getting me to 30mph. Lesson learnt, DO NOT whistle at elephants! The distance between Kasane and Nata was around 200 miles, too much to ride in one day and I looked to camp at the vet fence, a control point for the animals and a police checkpoint. After 106 miles I was still far from it. I had believed it would be closer and coming up to a broken down lorry, I spoke to the driver and said I would place my tent next to his lorry. The friendly chap smiled at me and shook his head, “you can’t camp here, there are lions, hyenas and the elephants come at night and pick things off of my truck, they will pick you up!”. I explained I wasn’t overly worried, that I could set my tent up close and crawl under the lorry if I needed to. Again there was a shake of the head and with that he flagged down a pickup truck. Now there were two guys shaking their heads at me, both thinking me to be completely mad for wanting to set up my tent. Both reaffirmed it would be too dangerous and reluctantly after a lot of pressure I agreed to put my bike in the back of the pickup to ride the last part to the veterinary fence. I was disappointed as I have ridden every part of the route so far, only taking lifts on side excursions not part of the main route. On arrival at the vet fence I spoke with a policeman asking where I could pitch my tent. He explained that it would be safer for me to sleep in one of the huts they used when they were off duty, regaling the story when they had another couple of cycle tourists pitch their tent accidentally on a route the elephants walked through the compound. Elephants don’t take too kindly to having things placed in the way of their known routes and had unceremoniously picked up the tent, complete with its occupants and moved it. Luckily there were no injuries. This story made me feel a little better about having gotten a lift a short distance. The following morning was a short ride to Nata, after which there not likely to be any larger animals, only those of the domesticated variety. 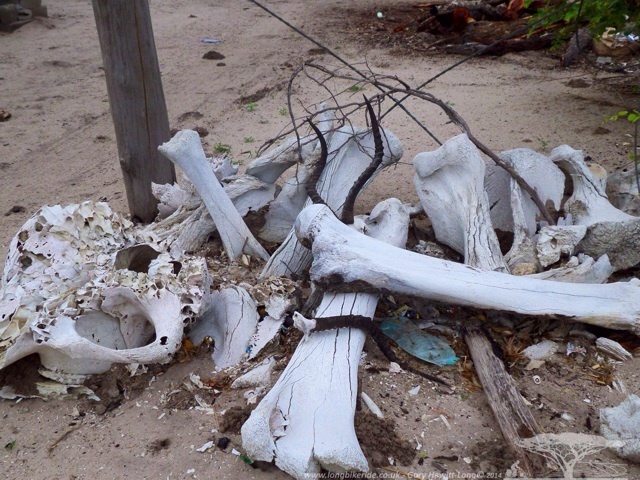 Outside the vet fence there were a collection of animal bones, including several very large ones from Elephant. As I rode past Nata I saw only one elephant, sadly a dead one. Throughout the trip I have seen so many dead animals by the side of the road, cattle, camels, dogs, cats, lizards, snakes etc but this was the saddest I’ve seen. A little further down the road was a large snake also a victim of the roads, I have still yet to see large snakes alive, hopefully I will before I reach the end of the trip. 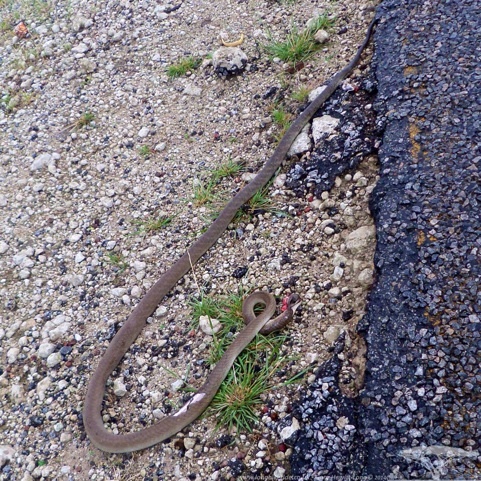 Although I am no expert, this looks to be a Black Mamba. One of the main towns en-route through Botswana is Francis Town where there are fast food joints. The weather looked like rain so I pulled into a wimpy for breakfast, the second breakfast of the day. As I was finishing my coffee the waitress came over and asked if I’d mind moving to another table as a large group of lads had arrived and would like to push tables together. I said no problem and moved. After the guys had settled I noticed a couple of them were wearing copper bull rings as bracelets and started chatting. 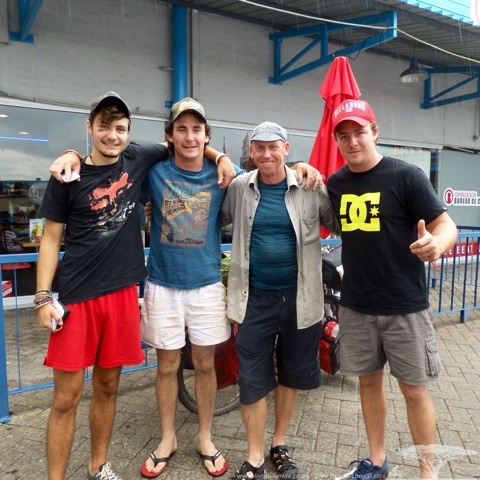 It turned out these guys were going to Maun fishing over the Christmas period. After explaining my trip to them they were interested to hear more and bought me another coffee and also offered to buy me another breakfast. I thankfully accepted the coffee but couldn’t manage a third breakfast. We swapped phone numbers and I was told that if I needed anything in South Africa or while in Jo’burg to give them a call. I was offered places to stay and even a flat in Pretoria! These guys were very kind and interesting to meet. 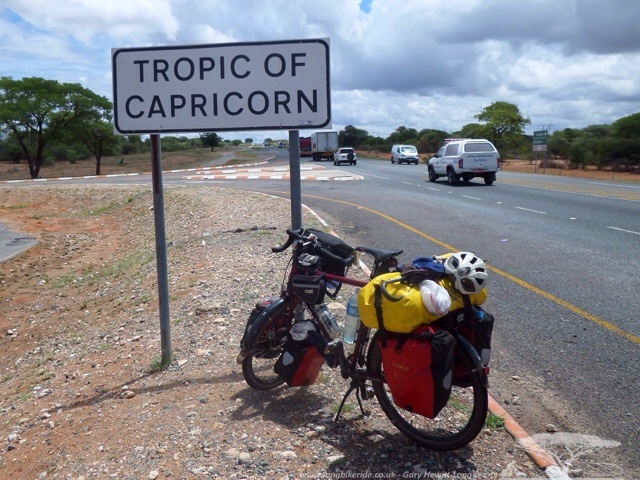 In July I crossed the Tropic of Cancer or Northern Tropic whilst riding though the Sahara desert. This is one of the five major degree levels and a point where during the Northern Summer Solstice the sun is completely overhead. 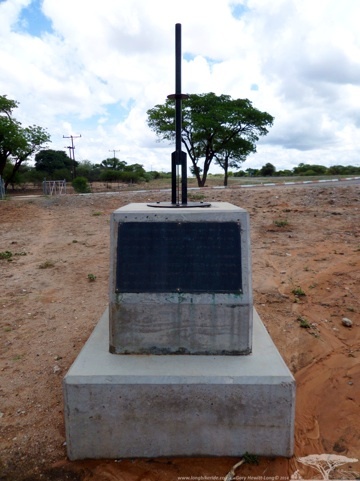 The Southern counterpart is the Tropic of Capricorn and I rode past this on the way to Gaborone, riding past it 155 days after the Tropic of Cancer, 5 months and 2 days. As well as the sign there was a tube and plaque, which on the day of the solstice the sun will shine directly down the tube. 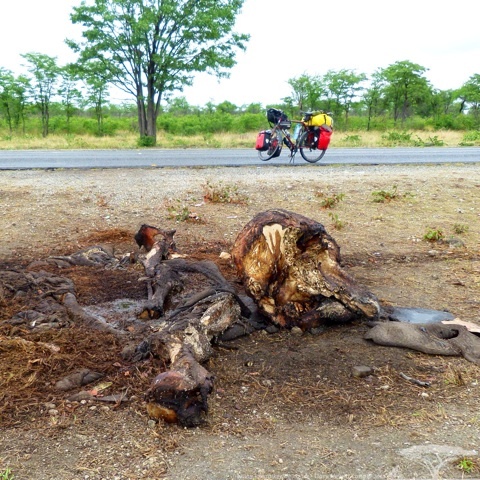 Riding in Botswana is fantastic, flat roads and you can easily cover good distances providing there is no headwind. The roads are good; apparently a few years ago they were not as well maintained, but now perfect in most parts. 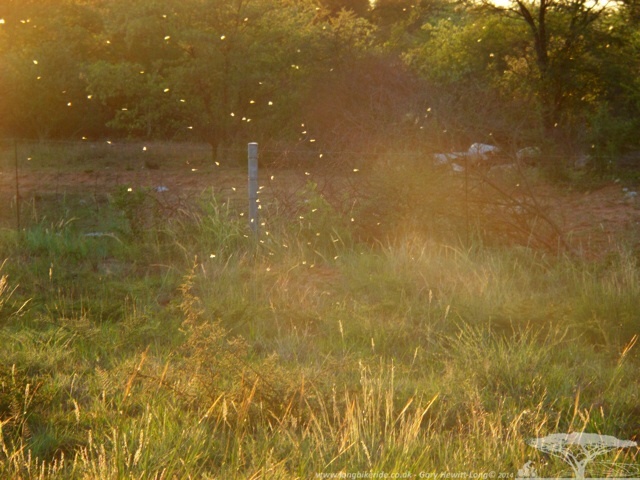 Riding in the early evening the light is great and in the softening sunlight flying ants were leaving there subterranean nests en masse, spiralling into the evening air, the light catching their wings. Botswana has a low population of around 2 million people and also few roads. There are many accidents along the highway and road safety signs are placed every 10 miles or so. 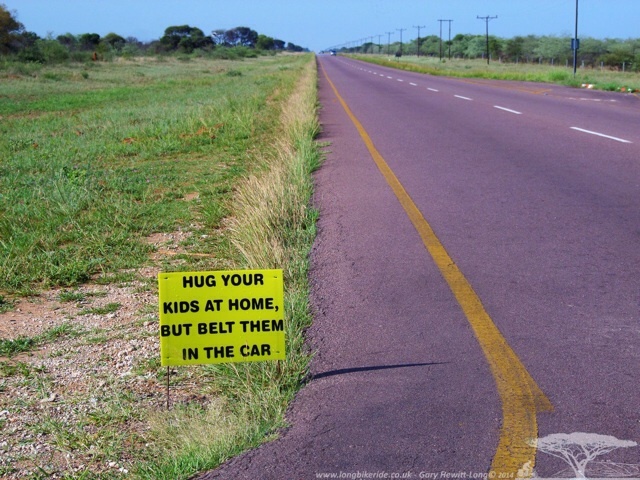 The Tswana people have a sense of humour, mixing humour with their safety messages. 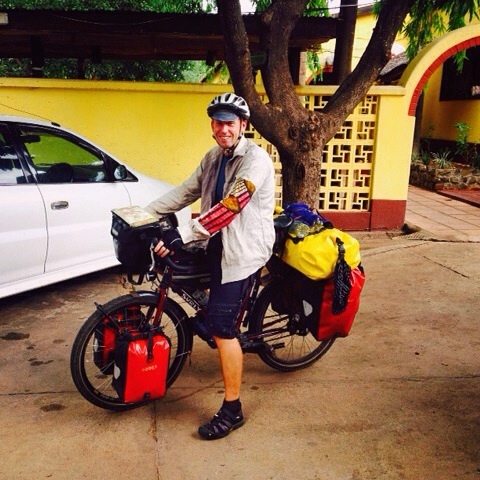 Whilst in Malawi my cycle tools had been stolen and I had arranged replacements in Johannesburg. Contacting the shop in advance confirming I would be there over Christmas, they confirmed their opening hours during the festive period. Closed on the 23rd December, re-open on the 5th January! Oh… this meant I wouldn’t probably be there to get them. 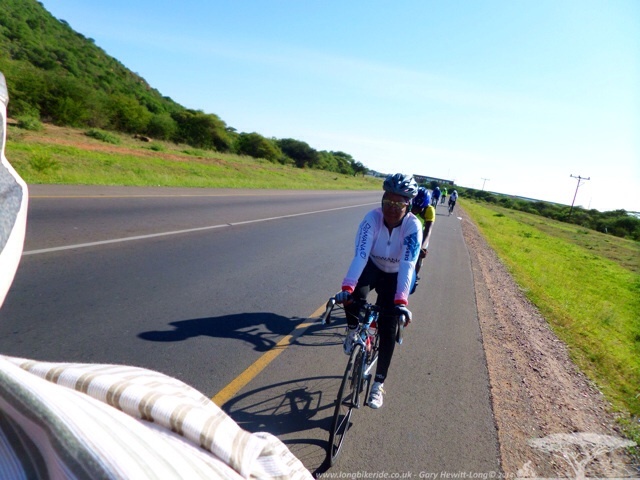 I had a contact in Gaborone to meet through a warm showers host Seneo and her husband Kutlo and they were cyclists. 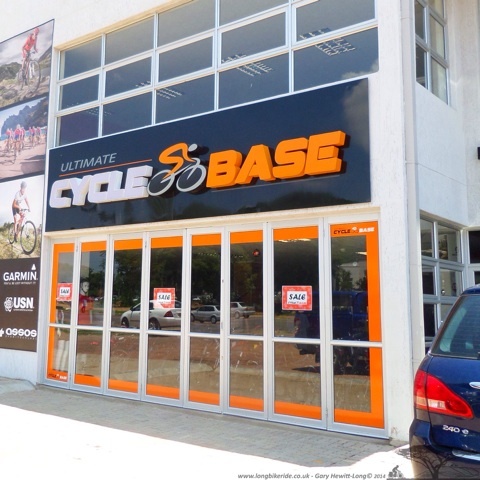 They explained there was a couple of good cycling shops in the city and were very kind to drive me to one of them, cycle base where I was able to buy a replacement Lezyne tool at less than the UK price! 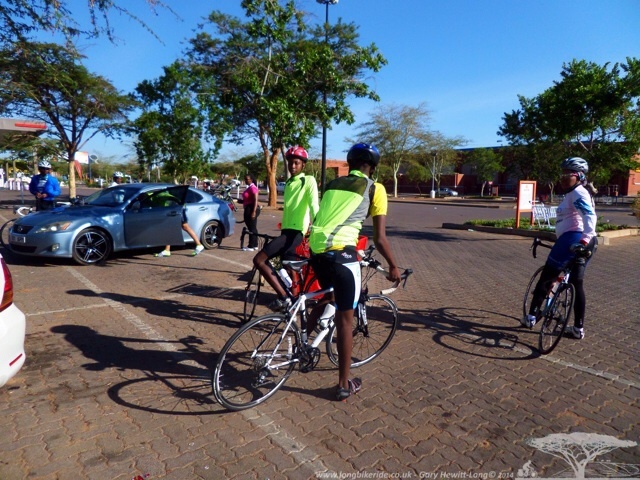 Seneo had organised for members of their cycling club to ride with me from Gaborone into South Africa as far as Zeerust and we met most of the other riders at a local car park before heading out. I was by far the slowest being loaded up so was put onto the front to set the pace. Cars drove by, the odd one tooting its horn, one couple even slowing to ask the name of our team. The border between South Africa and Botswana wasn’t too far away, there are 3 close to Gaborone to choose from and we used the Ramotswa border, close to Gaborone but quieter roads and a less busy border crossing than the others. We had time to pose for the camera at the immigration office. Not in order but in the photo are me, Seneo Mokgasan, Arnold Kokwane, Jeremiah Kokwane, Losika, David Lebalelo, Dan Tlale, Tebogo Seretse, Kabelo Daddy Kwape and Masego Kwape, Brian Thompson and Game Mompe. 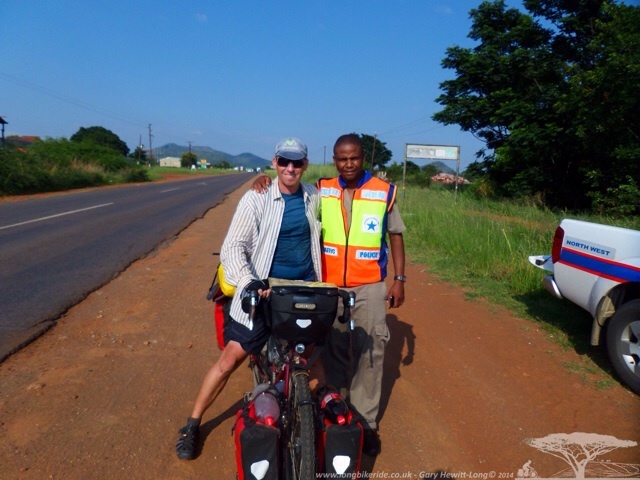 The exit stamp was put in my passport very efficiently and with a smile by the Botswana authorities and we cycled over the unpaved dirt track in no man’s land to the South African Immigration post. 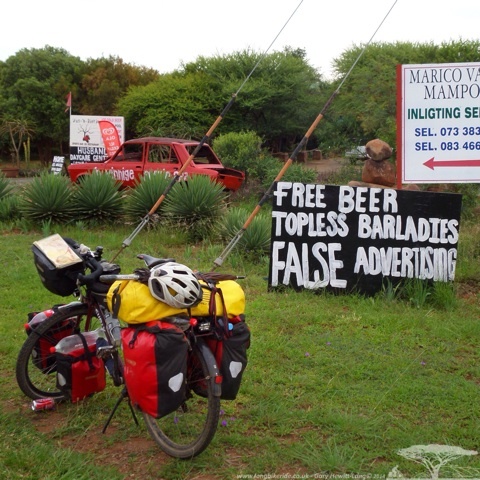 In all there were about ten of us cycling and a few as support in cars carrying drinks and food and after the SA border I took off my bags and put them into the car to lighten my load. It was hard to stop myself with a lighter bike and some strong riders we soon upped the pace and before we knew it we were going down the road at 22mph, my bike still quite heavy even without luggage and looking around there were two young lads with me keeping pace. But they were on Mountain Bikes! Complete with knobbly tyres! 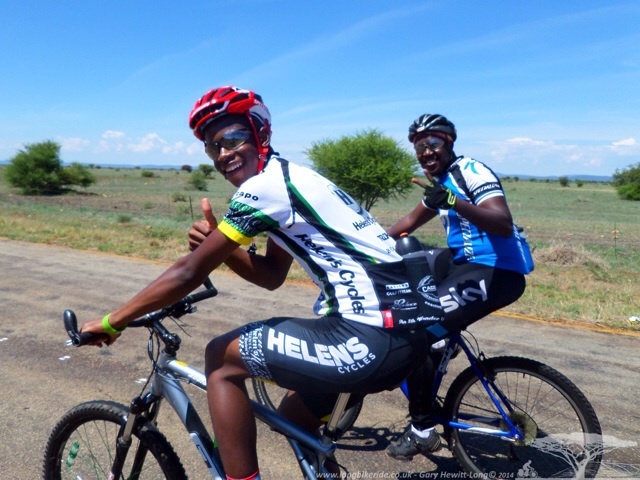 It turned out that one of the lads Losika used to be the Junior Botswana Champion rider and the other lad Arnold is the current Champion. Over the last few years I have ridden with some very strong riders and both of these lads especially Arnold have a lot of potential and I have no doubt they’d compete well with the best in the UK if they could get there to ride! Arnold and Losika, very strong riders. rest of Africa, although now I am in South Africa the choices are as good as anywhere else, we could have opted for Wimpy, KFC or several other restaurants. Between us after consuming masses of calories it was time to leave, I needed to find somewhere to put up the tent; it was getting cloudy and looked like a storm was coming. 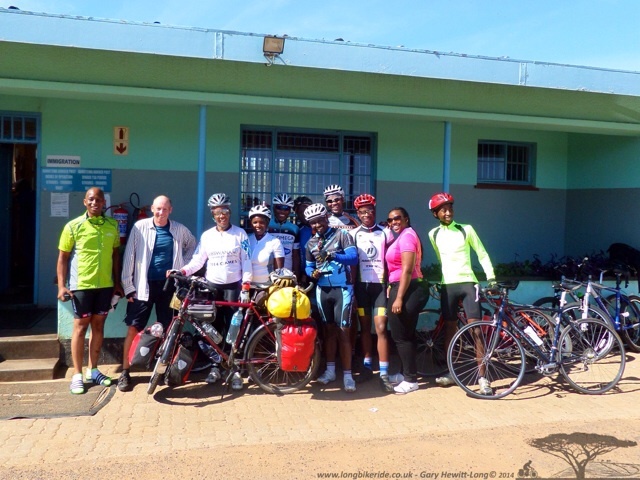 We had ridden over 80 miles and all the guys were planning on riding most of the way back to Gaborone!!! Some large ride for them! Heading further into South Africa we all cycled into a place that I could camp, the price was high and there weren’t many alternatives so rather than delay the guys heading home I filled my water bottles, loaded my bike and said for them to not worry, I’d find somewhere a little cheaper, after all I’d gotten to South Africa so far. After saying a goodbye to everyone I headed off back down the N4 towards Johannesburg. 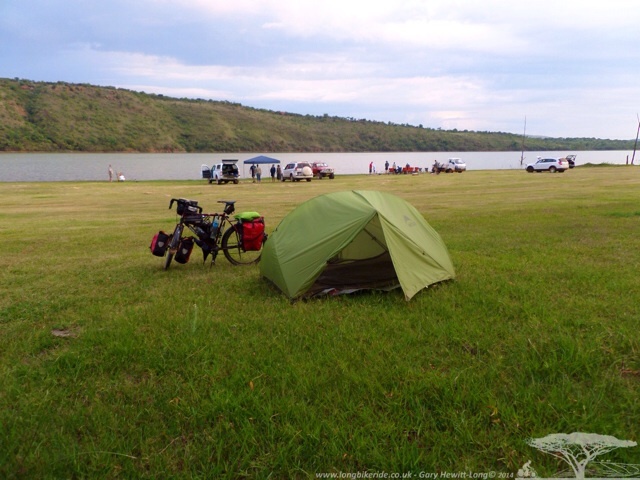 A short distance down the road I saw a sign for a fishing lake, the cost 30 Rand to put up a tent, bargain, less than £2. Coming the other way a pickup pulled over and talking to the driver Sarel, I explained I’d like to pitch a tent. 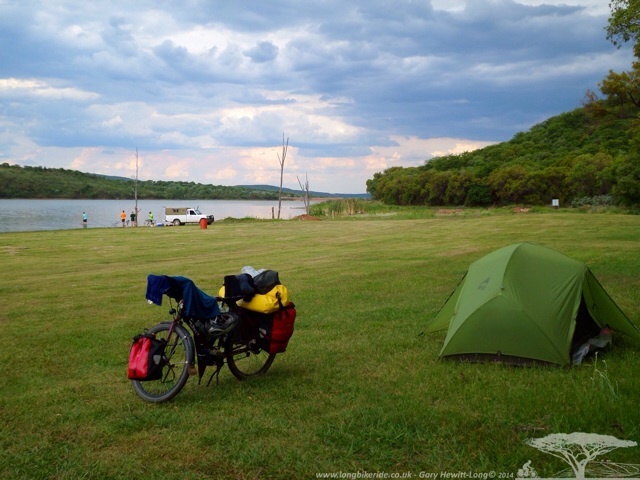 We briefly chatted about my trip and Sarel confirmed that there was a cold shower by the lake and that he doubted anyone would come to collect the money, just camp for free. I carried on toward the lake as Sarel pulled away and wow, what a find, mowed grass and a wonderful lake or dam, the Maricopoort Dam. There were guys catching carp and other fish by the lake and lots of birdlife, it was idyllic. I setup my tent, had a shower and went for a wander, speaking to Dan and his nephew fishing further up the lake. While we were chatting I noticed a pickup by my tent but wasn’t concerned as I couldn’t see anyone and carried on chatting. Some 10-15 minutes later I went back to the tent to be greeted by the truck owner, it was Sarel and this time with his wife. He asked if it was ok of they kept me company for the evening and produced some garden chairs and produced 3 lots of KFC for us all to eat.. Fantastic and so kind from someone I had only met a couple of hours previously. My second day in South Africa was another great one, riding out from the lake in the morning it looked like rain, but nothing happened. 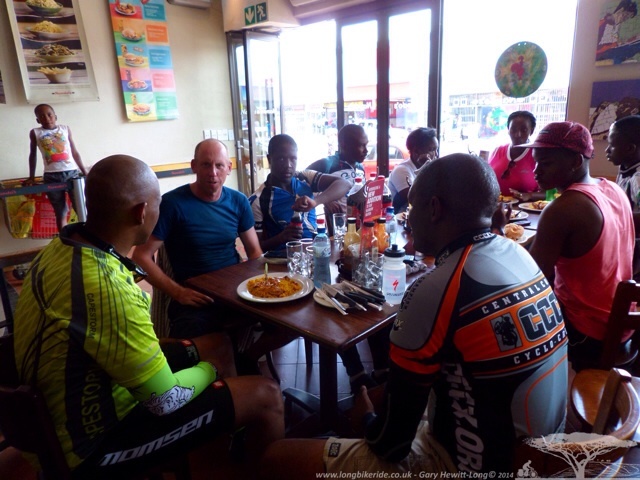 I continued along the N4 and got to a small town called Groot Marico where it looked like I had found the ideal place for a second breakfast! Unfortunately normally they served breakfast after 8am, but that day they were opening late at 10am so I continued further down the road and found another place. Whilst travelling along the N4 a lorry overtook me and pulled over onto the hard shoulder. The driver jumped out and handed me a loaf of bread, explaining that whenever he see’s “us guys”, I presume he means cyclists he gets them something to eat. How nice, no sooner had I gratefully received the bread he was back in his truck and off, even before I could ask his name. I managed to get a photo as he drove off. Friendly trucker just stopped to give me a loaf of bread! The N4 route was getting tiring, cars and trucks driving by at high speed and despite the portion of the road to the side being marked not to be driven in, vehicles constantly used it. 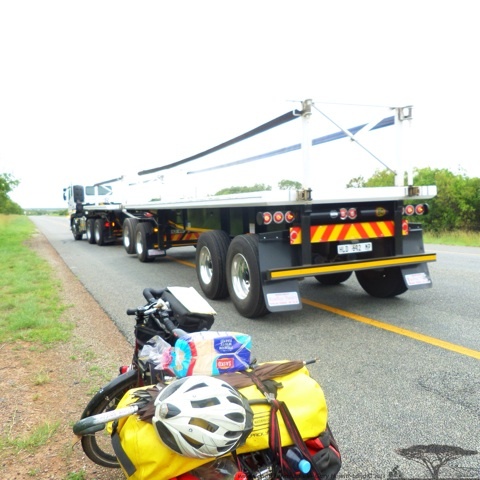 After a while I was getting apprehensive of the constant zoom of the large vehicles pulling around me and felt it only a matter of time before I was likely to be hit so made the decision to change route onto quieter roads. Riding along the last bit of the N4 before I turned onto the R104 I came across two road cyclists and started chatting, they agreed my decision to change route was a good one, more scenic. 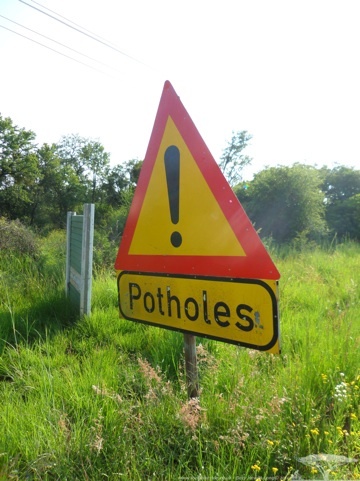 As soon as I was off of the main road, the signs started warning of potholes. At least there were signs unlike in England. Within 4 miles of leaving the main road I’d come across two police road checks, both of which pulled me over. One policeman wanted a photo with me and said he’d seen me the day before riding along the main road. 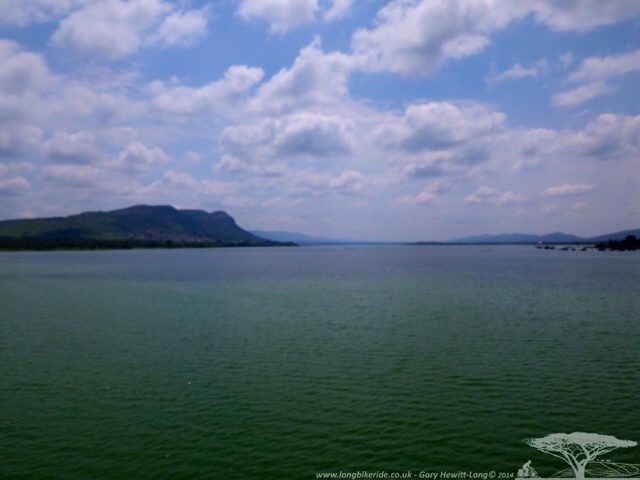 The route to Johannesburg was much better, riding past more dams, the Hartbeespoort dam was impressive, lovely clear water and nice lakeside houses surrounding it. The road into Johannesburg was hilly, very hilly compared to the flat of Botswana. But I was going to make it to Jo’burg in time for Christmas.